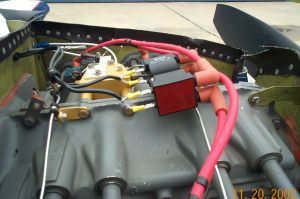 Well after 600+ hours of flying, getting bored at night, the rv-10 is not shipping yet, so I decided to try putting in an electronic ignition. Actually I had been thinking about this for a while. I was getting damned near smoked by fellow Team RV member Danny Kight during ACM (air combat maneuvers) in his 160hp RV-6 that sent me over the edge to buy one. Danny recently got his ignition working properly and was no longer lagging behind the rest of us. In fact, he was keeping right up with me. I could not let that stand!! So I finished my research and decided on the Lightspeed ignition system. Why Lightspeed? Cost and reliability mostly. There are quite a few manufactures out there. I will not go into the good, bad and the ugly. A search of the RV-Lists will show you all of that. So what's it do? Well besides having a hugely stronger spark, smoother running engine, better fuel economy, cheaper plugs, and a bit more horsepower, better starts, and smoother idle.. Not much. HA! It is quite a bit more modern. Rebuilding a mag is well, expensive, and painful knowing you will do it again soon. So off I went and put the $1375 charge on my CC for the Plasma III unit from Vans. It came packaged very well with adequate instructions. One thing I did not like was it said to mount it in a cool place behind the firewall. Well damn.. Im not getting upside-down for hours in this cold weather to do that. I saw lots of installations on the web with the control box mounted on the firewall forward, so that's what I did. Also I had to run to the hardware store to buy a 1/8 tee fitting to tee my manifold pressure. Cummon Klaus! Put that 30cent item in the kit will ya? Also 3' of vac line for the man pressure would also be nice. I took great pleasure in removing the right mag off my lycosaurus for installation of the hall effect pickup. Installing the hall effect pickup in its place was a snap. Wiring could not have been simpler. 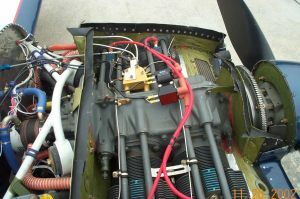 1 hot 12v lead, a ground, and the unit is wired for power. Wiring the coils was also easy. 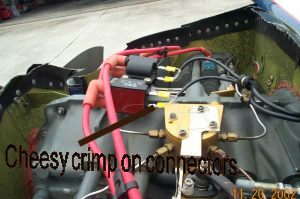 Strip the coax back, crimp on the leads, and you are done. The coil's came pre-mounted, and ready for bolting onto the block. Simple!. 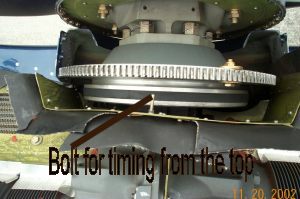 In fact, the only reason to remove the bottom cowl was to line up the timing marks. 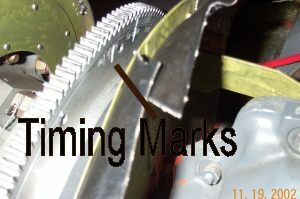 A note on the timing marks. 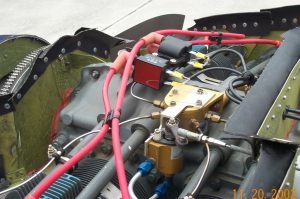 Since I did not want to take off the lower cowl every time I wanted to mess with the timing, I lined it up once, and put a bolt through the forward baffle at TDC 1so I could time it from the top of the engine, with only the top cowl off. I used a white marker to highlight. And whohlah. OK so this installed in about 2 hours. Here are some photo's. The first run up went perfect. On to flying. The very first thing I noticed was how smooth the engine was running. Second was the EGT temps were 20degC higher than normal. A good sign that the fuel burn mixture was burning better. As I established a nice cruise setup at 4kft, again I noticed how smooth it was running. Also egt temps took about 15 sec to stabilize, twice as long as mags alone. No explanation for this. BUT THEN.. I sensed it was not running so smooth, a very faint misfire. As I switched to EI alone, the misfire was very apparent. UGGHH!!. On 'both' it was smooth again with only a hint of a misfire. So something was wrong. 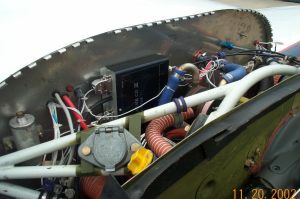 So I flew around some more, trying to watch the egt temps to identify the offending cylinder. I was not able to pin point the cylinder. So on the ground I went to try and isolate the problem. I moved wires around, swapped coils, moved plugs, data logged all egt temps and no joy. 4) remove the hall effect sensor and check the gap between the magnet and the pickups. 5) Call me if this does not solve the problem. I tried #1, and could not easily identify the offending cylinder. #2 and #3 also did not produce any results. So on to #4, but not before I called my buddies Danny, Subaru Bob, and Turbo Tom for their advise. I removed the sensor and called Klaus. Turns out I have a unit that is known to cause problems. The measured gap between the magnet and the pickups is to be round .030. Mine was .090. Klaus said that some units went out this way a year ago or so and you can tell if you have a unit like this by the thin washer under the nut. 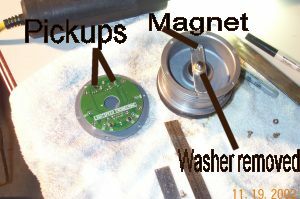 If you have a thin washer under the nut, you must put the thin washer under the swinging bar, raising the bar up, putting the magnet closer to the pickups. Measuring this distance is not very scientific, but my numbers tell me I went from .090 to .045 by moving the washer as he said to do. 1. High quality parts, well packaged. Good overall value. 4. Customer Service was very good. Thanks Klaus. 2. Installation guide was fair, but could have been much better. Again a troubleshooting guide would have been helpful, particularly on his website. 3. The crimp on connectors to the coils seems cheesy. I know of many rv's flying w/o incident with these all over their planes, but it still seems cheesy nonetheless. 4. I hate buying a 'kit' and having to go buy other items necessary for installation. I had to purchase a tee fitting and vac hose. Not a big deal, just another run to the store for parts when I am settled into the hanger trying to get a job done. OK Danny, when are we going flying there bucko? Check Six! Found it (web page), thanks for that! There seems to be a misunderstanding, about the " faulty " hall effect module. I would never send out any system with a known problem! At the time this system shipped to Vans, this gap problem was not known. In Feb. 2002 I decided to reduce the clearance a little bit because about 3 % of the modules had a little to much of a gap. I have added the warranty card specifically to be able to contact customers in case a problem shows up and I need to contact the owners. These are only rarely returned. 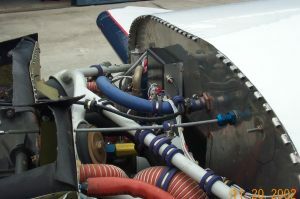 I have not consider including a T because many airplanes do not have an existing manifold pressure line. The 1/8" tygon tubing will probably be included in the future.